A cloud of cake for your Fair Food fruit. This here is a super quick and easy cake that you can make with stone fruit, apples, pears or berries. Just whip up a batter, top with fruit and it’s cooling on a rack in 30 minutes, smelling divine. Great with an afternoon cup of tea or for a quick desert with all the trimmings. And get out your best cast iron pan or camping skillet because you can just bake it in that. This recipe is quite literally scribbled on the back of an envelope and taped in to my little recipe book. I’d jotted it down from a long forgotten blog years ago. The page is well frequented (it’s next to a friend’s birthday carrot cake) as it’s the kind of adaptable and forgivable cake that I like with Summer fruit! 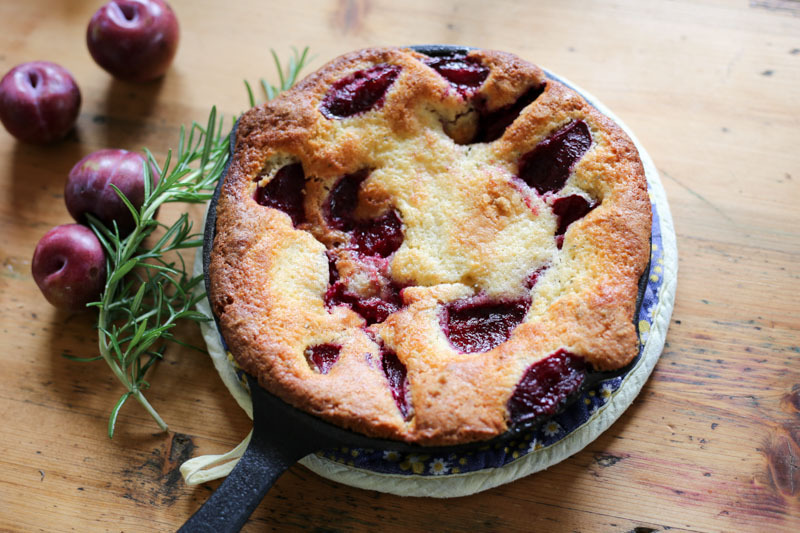 Alas I can’t recall it’s origins, though a quick google search had me finding several similar recipes – perhaps by now we can just call it, as it is in my scrap book, ‘that skillet cake for fruit’. Cream the butter and sugar until lightened and fluffier. Add lemon zest, rosemary, eggs and vanilla. In a separate bowl, combine the dry ingredients of flour, salt and baking powder, then gently mix it in to the batter, incorporating the yoghurt as you go. Pour in to the greased skillet or pan, cover with fruit and sprinkle with a little brown sugar. Bake for 30 minutes or until it’s browned and just cooked in the centre. Leave the cake to cool in the pan before turning it out. Enjoy! Looks delicious, and I’ll be happy to make it in a gluten free version. The gluten free label is incorrect at present, though, as it lists regular plain flour in the ingredients. True, Judith! Have corrected the category! Hope you enjoyed it, such a handy one to have on hand. Made this tonight and it looks wonderful. Won’t be eating it until tomorrow, so can’t answer for flavour. Thanks for the recipe.